Halloween can be known as a scary time of year, but it’s also a time for fun costumes and delicious treats! Scaring should always be good-natured and not pose any real threats. The best Halloween is a safe Halloween. Here are some safety tips to make sure you and your family have a fun and safe trick-or-treating experience. Parents: even if your younger children are going in a large group it is still advisable to walk with them while they trick or treat. Also make sure you tell kids not to eat any candy while trick-or-treating (as difficult as that may be for them) until you have inspected it thoroughly. Make sure all wrappers are closed and there are no signs of tampering. If a candy wrapper is open, discard the candy. Many homes go all out for Halloween with decorations and may even invite trick-or-treaters inside. Never enter a stranger’s home alone, and make sure a trusted adult is with any children before entering an unknown home. If a house is completely dark, it is best to skip that house and move on to the next one. It is never good to encourage a child to approach a dark home, and typically this means the residents do not want to be bothered. While walking around at night, visibility is crucial. Carry flashlights and give each child a glow stick to wear around his or her neck. They can even be incorporated into the costume. Cracking the glow sticks to activate them can also be made into a fun Halloween activity! You can also purchase reflective tape at hardware or sporting goods stores to apply to costumes and candy buckets. Stay on the sidewalk whenever possible, or if there isn’t one then stay as close to the side of the road as possible and walk against traffic. Remind children that safety is still the number one priority, and they should never dart out into the street even if it is full or trick-or-treaters. You cannot depend on motorists to drive more carefully just because it’s Halloween. Halloween costumes and makeup can pose dangers of their own. Some costumes are made from materials that are highly flammable, and candles are often used in Halloween decorations. 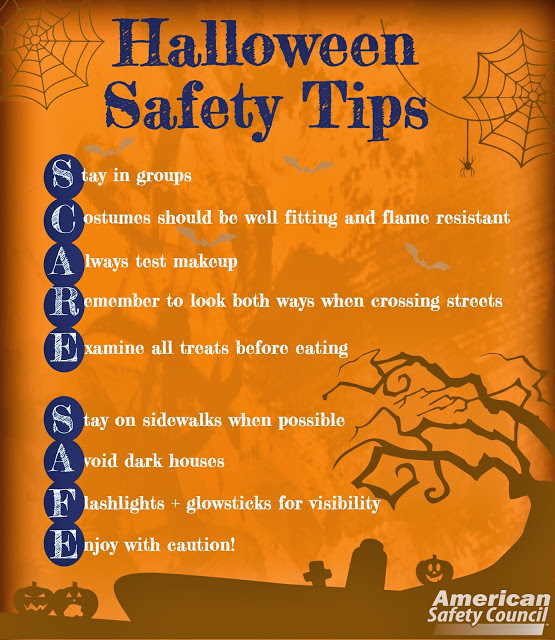 Make sure your costume is flame resistant, and make an effort to stay away from any open flames. Costumes that are ill-fitting can also be dangerous. Costumes that are too long or baggy can cause a child to trip or get caught in decorations. Good shoes are also extremely important when walking at night. It will be dark, and there could be lawn decorations or even just bumps in the road that cannot be seen. Shoes that do not fit well can cause you or your child to trip. Some makeup is made from substances that are harsh on skin or won’t wash off. Factor this into your plans for the evening, as sleeping with heavy makeup can cause it to get into your eyes which can result in an infection. If makeup is a major component of your costume, plan on showering before bed to get it all off. Have fun, be safe, and have a happy Halloween!